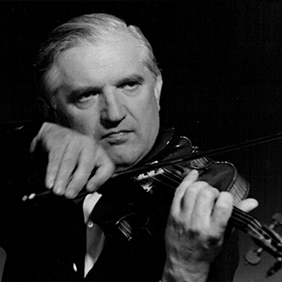 As a young boy in Hungary, Thomas Varga was first taught by his father, an excellent violinist. He soon showed extraordinary talent for the instrument: at the age of ten, he played Mendelssohn’s Violin Concerto and began touring abroad at the age of 14. His career was interrupted by World War Two, during which time he studied philosophy at the University of Budapest. After the war, he resumed playing as a soloist. His artistry reached a pinnacle and he became one of the most sought-after violinists in the world. He took a keen interest in the music of his time and premiered the concertos by both Berg and Schoenberg in Europe. The two composers wrote to him to express their admiration. In the 1950s, Varga became an equally successful conductor and founded several orchestras, including the Tibor Varga Chamber Orchestra. In 1963, he founded the Music Academy of Sion in Switzerland, as well as the famous music festival in the same town. He died in 2003 in Grimisuat, Switzerland.